Happy 2012 everyone! It's a new year and I think that calls for a new format for this blog. I realized part way through last year that I was no longer doing the daily thing, so why was I still prefixing the title with the date? Also, I'll probably give the site a different look at some point. For now, I'll get 2012 rolling with some star trails. 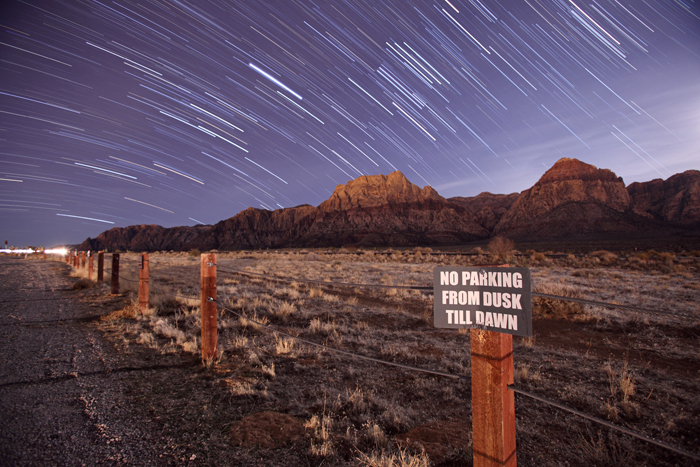 I got up just after midnight (this morning) and drove out to Red Rock to catch the Quadrantid meteor shower. I didn't really see anything, most likely thanks to a super bright gibbous moon, but I wasn't about to let the night go to waste. I knew I wanted to feature this sign, especially since I parked right in front of it. This is the first time I've ever tried a composite star trail photo (I usually do a single long exposure). It's much easier than I expected thanks to this Startrails software. I combined 70 consecutive 30-second exposures (35 minutes) to produce the image below. Now that I know how well it works, I'll try staying out there longer. Shots like these make me so glad I pulled the trigger on the 5D Mark II. There's absolutely no way this would look anywhere near as clean on my old 30D body.